The deets: Wet Seal dress; F21 jacket; Nordstrom fedora (similar); DV Dolce Vita shoes; Gigee Marie clutch; Ray-Ban sunnies; Michael Kors watch; link bracelets c/o Color by Amber. 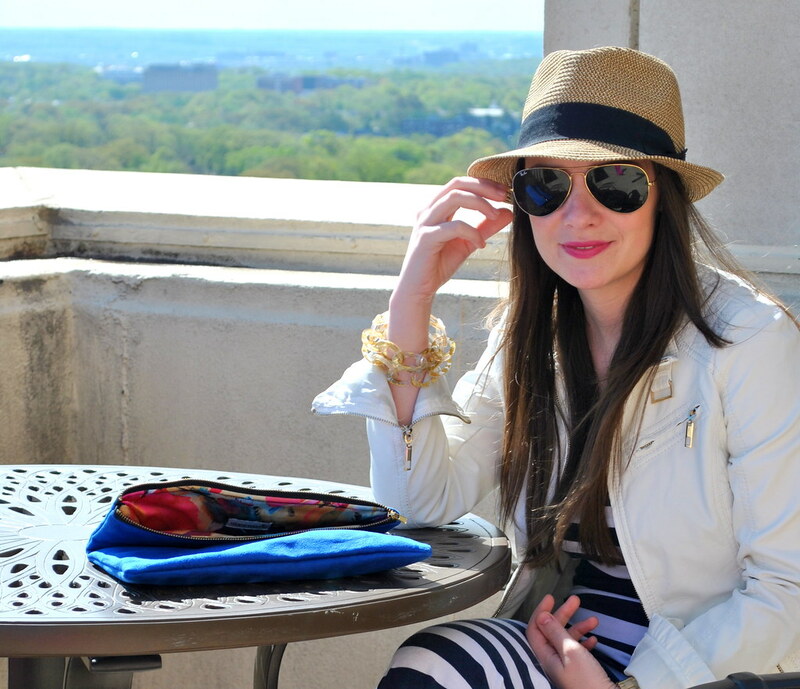 Rooftop/patio/BBQ season is upon us and nothing compliments it better than a maxi dress. This cozy cotton one only cost me a measly thirteen dollars (if you read this blog regularly you know I have a shopping addiction and the only store within walking distance is Wet Seal), so fun-time penalties like spilling beer and/or dripping mustard all over myself aint no thang. Also - how cool are these bracelets? They are made from 40% recycled materials so basically I'm helping the planet and accessorizing at the same time and that = WIN WIN! Such a fun dress and I love those bracelets. 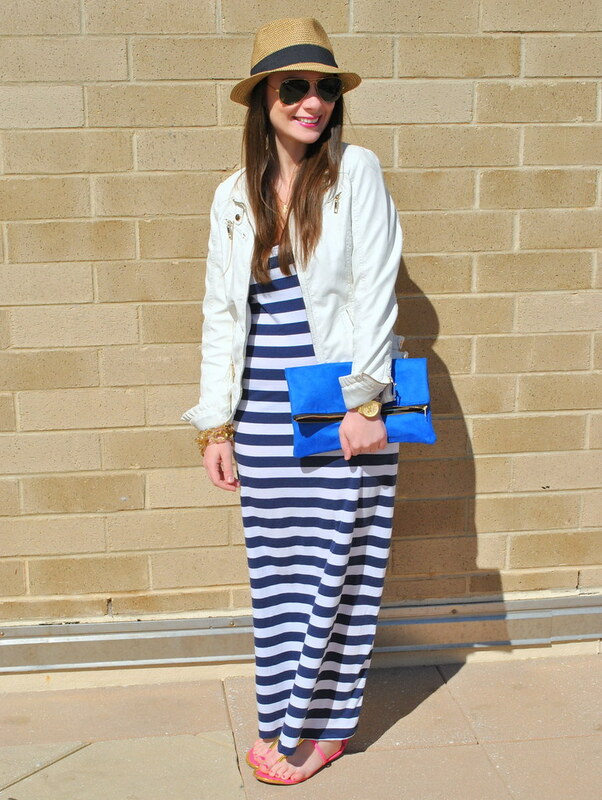 I love the maxi with this hat! Perfect combination! Dammit, now I need a striped maxi dress. Thanks a lot! Totally spring chic! You look awesome in a hat–I definitely want to re-create this look! 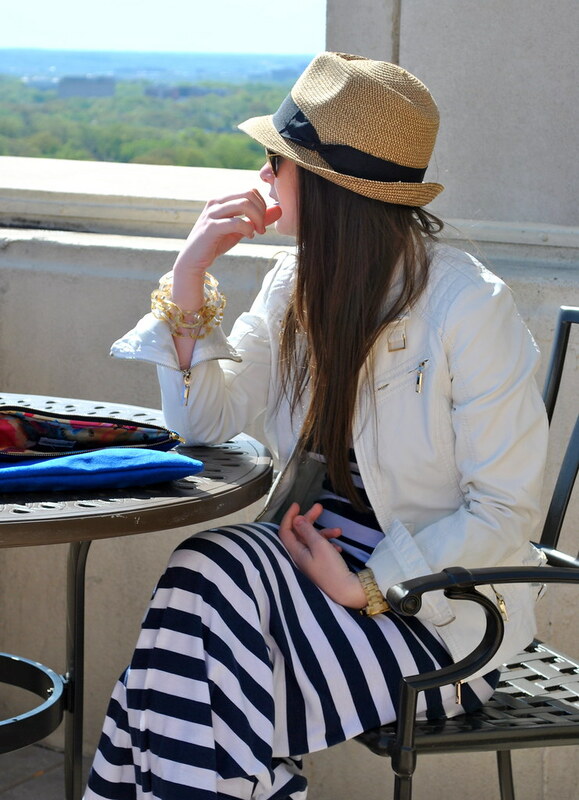 I love this striped maxi. And how cute is that hat on you! you look so pretty in the dress and the hat! love that chunky bracelet! Love this! I have a similar hat from Target and always need new things to wear it with! I need a striped maxi in my life pronto. And I've been eying up those sandals - LOVE! You look so summery, I'm so ready to wear dresses and sandals! Sadly, our weather isn't consistently there yet! I love the maxi and blazer, really suits you!!! The view from the rooftop is gorgeous! Love that maxi dress!! Ahh I wish it was warm enough around here for patio's, soon enough i guess. loving this ensemble. i just bought a maxi dress and really want to wear it but it's been too darn chilly here the last few days in dc. i didn't even think to pair it with a little jacket like this. looks like i have my weekend outfit picked out!